Destination: Quarry Lane, Upton, West Yorks, WF9 1DA. Directions: Situated just off Field Lane close to Upton Beacon (if you get lost, just aim for the prominent funnel-shaped water tower), the ground is about 20 yards up Quarry Lane on your left. 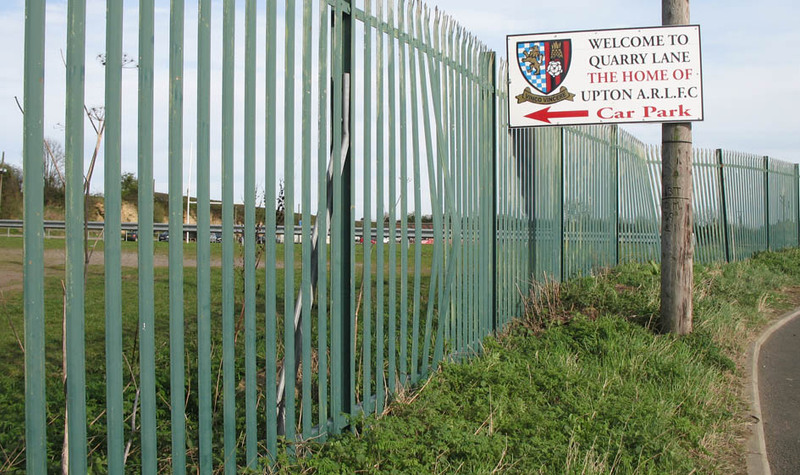 It is signed ‘Upton ARLFC’, as its main tenants are Upton Amateur Rugby League Club. The nearest rail stations are South Elmsall and Moorthorpe. South Elmsall would take you about 30 mins to walk from; Moorthorpe a few minutes longer. Or there are buses from either station, and buses also run from Wakefield and Pontefract to Upton. Off The Pitch: The venue comprises a football pitch and a rugby pitch side-by-side. The pitch is unrailed, but there are some floodlights down 3 sides of it – whether these are enough to light a night game in pitch black or just provide some extra light towards the end of winter afternoon games, I dunno. There is also a clubhouse open for drinks/food, which I didn’t venture over to today. Plenty of parking space too within the ground, and the clubhouse end is tarmaced behind the goal so you don’t have to drive over the grass. On The Pitch: Although situated just a couple of miles away from the likes of Frickley Athletic and South Kirkby Colliery, a few decades ago Upton possessed quite a prominent non-league side too, with Upton Colliery having a degree of success in the Yorkshire League, and also winning the Sheffield Senior Cup twice in 1937 and 1950. Nowadays, with the colliery itself long gone, there is only one notable Saturday League side in the village (a second Upton-based Saturday side, Upton & Harewood Social, withdrew from the Sheffield & Hallamshire Senior League Division One on the eve of the 2010-11 season due to lack of players). But there is also a Sunday side, Upton Wrangbrook, who play in the Castleford & District League and use the old Colliery ground still. 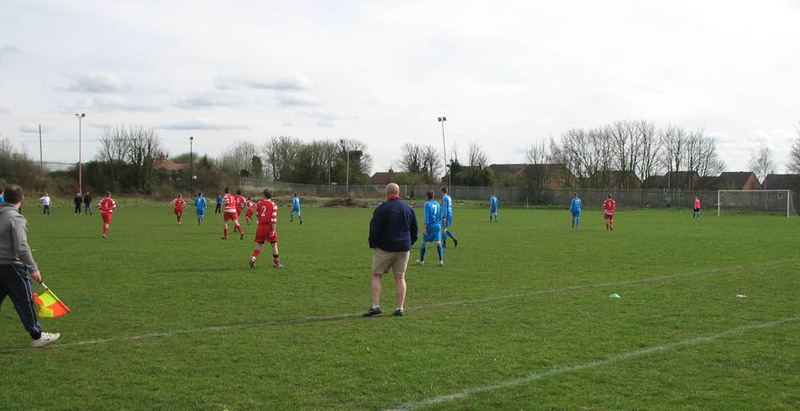 Hatfield Main meanwhile, are a notable former Yorkshire League/NCEL/Central Midlands League club, who folded near the start of last season and have since reformed again in the Doncaster & District League (with Division One sitting effectively at Step 10 of the non-league pyramid). A few weeks ago in January, Upton were top of the league table. Now they sit in 4th and after this game, Hatfield Main are up to 2nd (though have played 3 games more than the team in 3rd). Bramley Sunnyside look comfortable at the top though. Other results in this league today involving the two lowest-placed teams were 16-0 and 14-1, reflecting the gulf that seems to exist between top and bottom teams. I arrived just as the second half was starting, at which point Hatfield were 2-0 up. Hatfield have been on a good run of form lately, though the mother of one of their team told me that they had several important players missing today – including their top scorer, their dead ball specialist, and their only regular goalkeeper. They still looked the slightly better team on show, though Upton rallied towards the end. After having a great strike ruled out for offside, they benefiited from some route one stuff and the flight of a speculative effort was misjudged by the stand-in away keeper to make it a tense finish. Hatfield held out though, and also hit the post twice while I was there. It can be a bit of a hard site to navigate when you’re new to it – just make sure you’ve selected the current season from the drop-down box (and the relevant division), and then you can click on Fixtures or the League Table, etc. Next to each fixture should be listed the venue (together with a little ‘map’ link box) and the kick-off time. This entry was posted in A-Z by club (home team), Uncategorized, Upton Brookside. Bookmark the permalink.